Farmer-owned Arla Foods is to build a groundbreaking innovation centre in Nr. Vium, Denmark to unleash the wonders of whey. Part of Arla Foods Ingredients, the new centre will be home to leading scientists and innovators who will discover and deliver new ways of using milk and whey to serve the needs of the world’s growing population. Arla’s belief in innovation being the key to unlocking the future of dairy was demonstrated when it opened Arla Innovation Centre (AIC) in Skejby, Denmark last year. 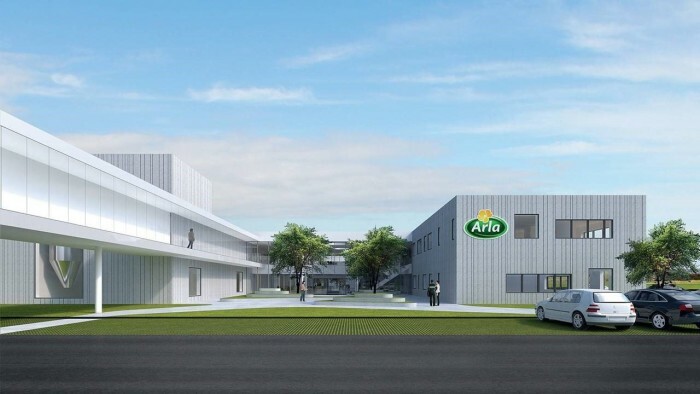 With the EUR 36.3 million investment, Arla is now creating a hub for research and development innovation within whey and milk based ingredients. The investment in the innovation centre, which is expected to open in 2021, was recently approved by Arla Foods’ Board of Directors, supporting the company’s strategic focus on innovation. The centre will be part of Arla Foods Ingredients (AFI), the Arla subsidiary that has transformed whey from what was once considered a waste product to premium, high quality ingredients used for infant nutrition, clinical nutrition, sports nutrition, health foods and other foods and beverage products. The new centre will be located in Nr. Vium, Denmark in close proximity to Arla Foods Ingredients’ largest production site, Danmark Protein, creating a unique environment for process development and pilot production. At the centre, scientists, technicians and innovators will cover all aspects of research and development within whey and milk – from advanced separation technologies to isolate specific components of the whey or milk, to heat treatment and pasteurization technology to improve functionality and shelf-life. “The colleagues working with innovation in AFI are among the most talented in the world and it is our ambition to continue to attract the very best calibre of colleagues that share our mission of discovering and delivering all the wonders whey can bring to people’s lives. This will be an exciting place to work with the most challenging development projects in the dairy industry,” Henrik Andersen says. It will be a 9,000 square metre state-of-the-art facility with open office spaces, labs and a pilot plant. The centre will employ up to 90 people.